Just regular folks. : Plait, SAT, Jamie. 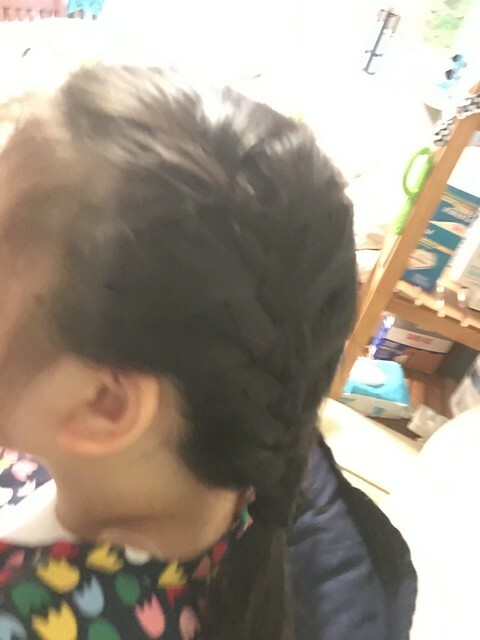 I plaited Edda's hair this morning. First summer 'do - all the hair up off the neck, tightly constrained. In a probably unwise parenting move, I had signed Vince up to take his first SAT this morning right after the Kendrick Lamar concert. (He got home at 1 am, Maxi barked her head off waking us all up, he had a great time. There were lots of people smoking pot, but not him.) This is primarily a baseline SAT which is discretionary, and I kind of hinted that maybe he could skip it earlier in the week, but on Wed, he was like - no, I'm up for it. It was a slightly different story when I tried to nudge him awake at 7 am. I signed him up for it in the wake of all our college trips this spring. I will admit that this spring was tough for me (and Vince) college-wise and figuring out what kind of parent I want to be through this whole college admission process. I have the stereotypical Asian-mom in me and I could see it coming out in many ways this spring to the detriment of my relationship with Vince. A lot of college admission is wrapped up in my own ego - where the status of the college can be a quick shorthand for how excellent of a parent I am. And, of course, I want to be the most excellent parent. It's also wrapped up in the fact that I get to do it only once, when I thought I would get to do the whole thing twice. So I had to take many, many steps back and take a look at what I wanted to do the last two years I get to parent Vince at home. I know what I want to do, I know what things I want to show him, I know the relationship I want between us. Of course, one would think that I could calmly do this, but it is not true. Jeremy & I sat in the car waiting for him to finish the exam. We thought we'd take him out to lunch to celebrate. Maybe celebrate isn't the right word. Vince was tired and just wanted to head on home, so we dropped him off and went to our neighbor's house where he was hosting a common cause gathering. 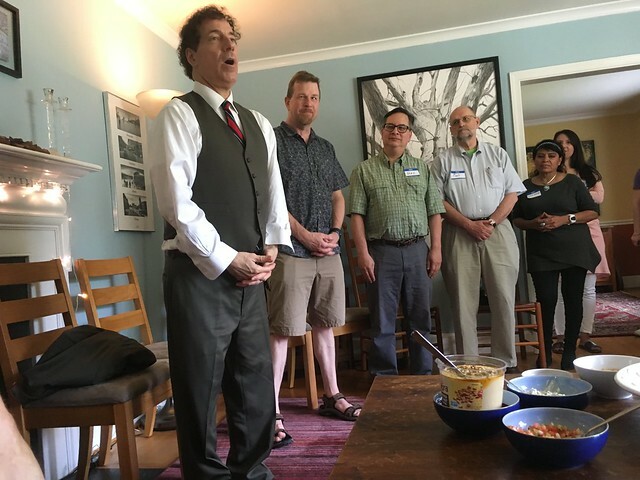 A short speech by Jamie Raskin, our rep. And I ate a lot of BBQ pulled pork.